Again, as soon as I pulled up in the paddock area where the nest tree is situated a bird was sighted, that was a good start! I had another great session observing both the owls as they fluttered around their territory, there was also some great opportunities to capture some images. Of the two birds the male is by far the most mobile and vocal, so to catch an image of both of them was a real bonus. On my last visit I had the x 1.4 converter attached to the new 500mm lens, this is great when the subject (the owls) are at distance but it also has its disadvantages, especially at this site when the birds come too close. One such occasion where I was pleased the converter wasn't attached was when the male owl dropped down onto the grass right in front of me, this is a full frame image at 500mm. On this visit rather than just park the car up and wait for the birds to come within range I chanced moving the car on a couple of occasions, the birds didn't bother an iota. This allowed me to get the best angle for some images of different perches and backgrounds. Initially the light levels weren't too good, but as the evening drew to a close the low setting sun came out and offered a nice even golden hew to the resultant images. In this next image I like the way the setting sun is captured in the birds eyes and the diffused grey backdrop is of the distant trees. Another slight move of the car allowed me to capture this slightly different type of image where for a few seconds the setting sun changed the distant hedgerow into a sheet of various shades of gold. When one spends as much time as I do photographing Little Owls getting an image that's a bit "different" from the normal becomes a real challenge. For the majority of the time I have to be satisfied with the "owl on a post" shot, or the very occasional iffy flight image. For these reasons when something slightly different presents itself (which isn't often) the chance has to be seized upon. I know this next shot is nothing spectacular but I do like the way the owl is peering around the branch at me. The male owl was continually territorial calling whilst I was there, this next image is a typical example of catching him in the act. I am still not convinced that the birds have re-established themselves at this site, especially as during this visit I noticed another couple of squirrels near the nest hole. 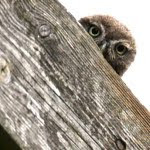 I have told the landowner that their continued presence could well deter the owls from breeding again, he is going to do his best to "make them go away". 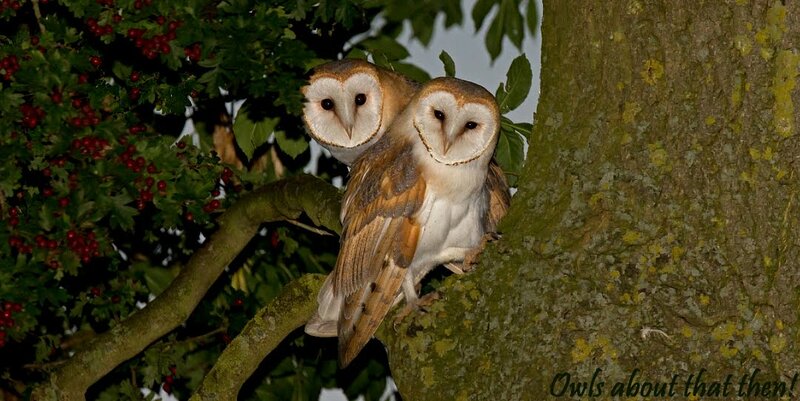 Thanks for stopping by and catching up with my owls, hopefully there will be more to come and an update from this site in a few days time. Paul great images, are you using the distsnce/focus range switch on the side of the lens? If I know there's a chance of the bird being close I use 4.5m-infinity (looks like a number 8 on its side) this enables focusing of the subject matter really close. I apologise if you're already using the setting. If I'd taken any one of these, Paul, I'd have been over the moon. Fabulous results!! Thank you buddy, you know that you are more than welcome to join me at this site if ever you fancy it? Superb set of images mate!!! !